Brighouse Town’s miserable run in the Evo-Stik NPL continued yesterday with a 5-1 defeat away to Hyde United. Vill Powell’s side slipped to third from bottom of Division One North after Tom Pratt hit a hat-trick for the hosts. Hyde has been gripped by FA Cup fever, with a home FA Cup tie against League One MK Dons to be shown live on BBC Two on Friday, November 3. 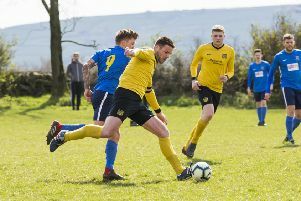 The game attracted the division’s biggest gate of the day of 377 and they saw Brighouse crack twice in quick success with Harry Coates grabbing a 17th minute opener and Pratt bagging his first a minute later. The visitors dug in after that and got themselves back in the game six minutes after half time when a cross evaded defenders and Matty Ord cashed in. Brighouse’s hopes of getting anything out of the game were dashed when Pratt got his second on 68 minutes. He completed his hat-trick from the penalty spot and Luke Porritt grabbed the final goal for Darren Kelly’s side with nine minutes left. It was Brighouse’s fourth league defeat in a row in October. Their next NPL game is at home to Trafford on November 4.